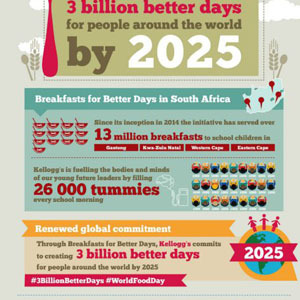 Since Breakfasts for Better Days launched in 2013, Kellogg Company has helped provide more than 1.7 billion servings of food to people in need globally, exceeding its original milestone to provide 1 billion servings by the end of 2016. The company has also already supported the livelihoods of thousands of farmers around the world, including smallholders and women. Its new commitment to provide 3 billion meals for people around the world by 2025 furthers this important work of fighting hunger and feeding potential through its Breakfasts for Better Days purpose platform.